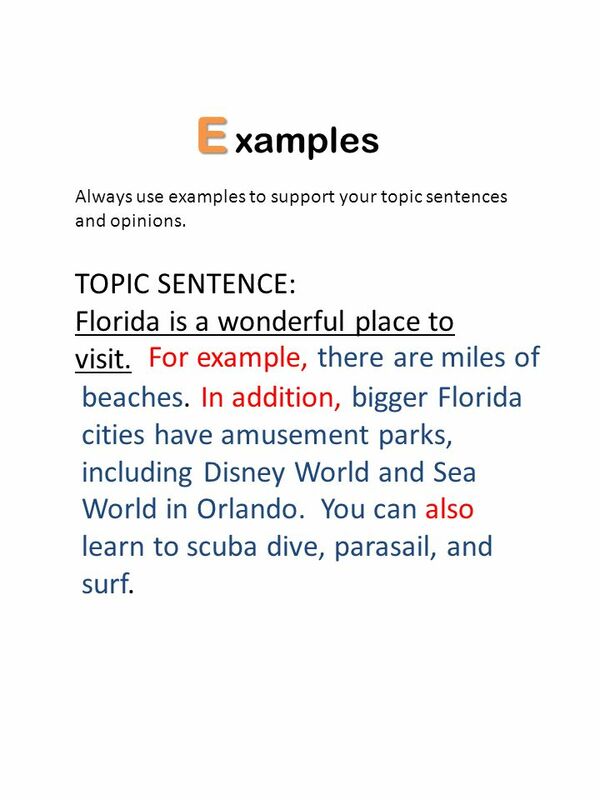 2 E xamples TOPIC SENTENCE: Florida is a wonderful place to visit. Always use examples to support your topic sentences and opinions. TOPIC SENTENCE: Florida is a wonderful place to visit. For example, there are miles of beaches. In addition, bigger Florida cities have amusement parks, including Disney World and Sea World in Orlando. You can also learn to scuba dive, parasail, and surf. Write three examples to support the following topic sentence. Be sure to connect your ideas with transition words. 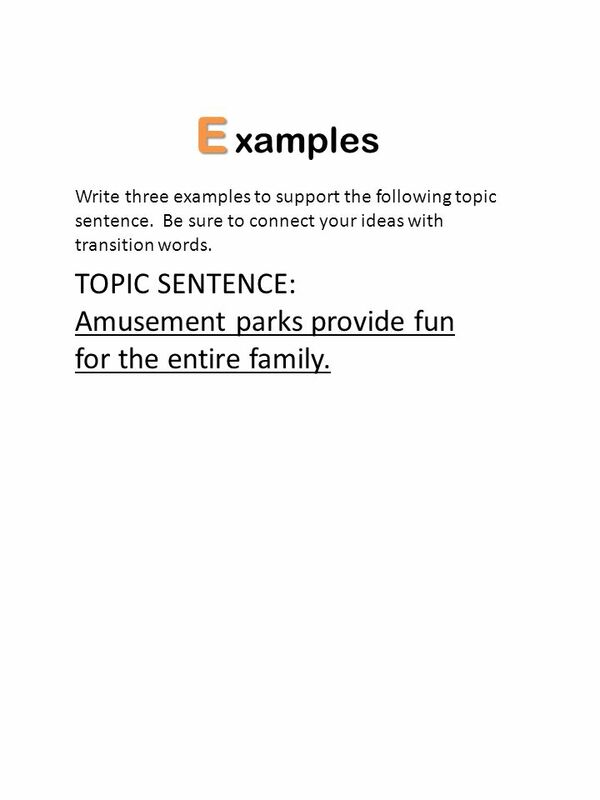 TOPIC SENTENCE: Amusement parks provide fun for the entire family. 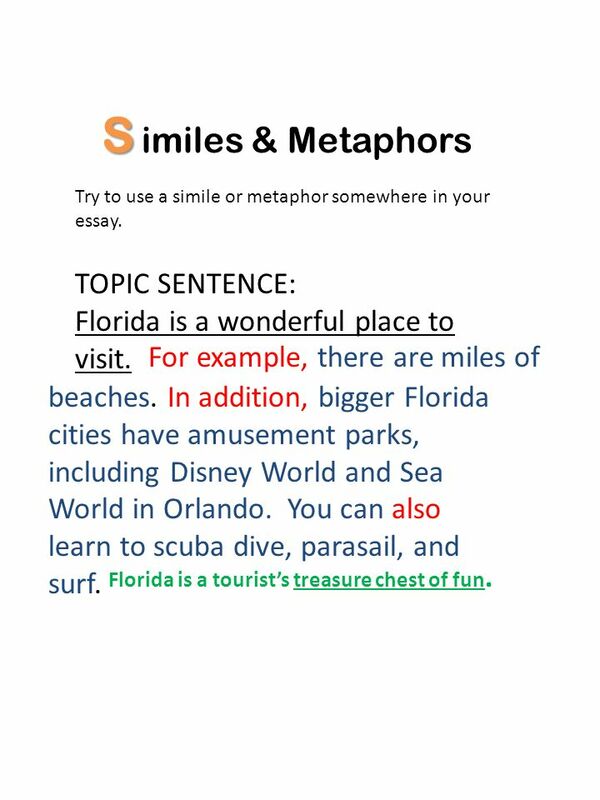 Try to use a simile or metaphor somewhere in your essay. TOPIC SENTENCE: Florida is a wonderful place to visit. For example, there are miles of beaches. In addition, bigger Florida cities have amusement parks, including Disney World and Sea World in Orlando. You can also learn to scuba dive, parasail, and surf. Florida is a tourist’s treasure chest of fun. Try to spot the similes or metaphors in the following sentence. 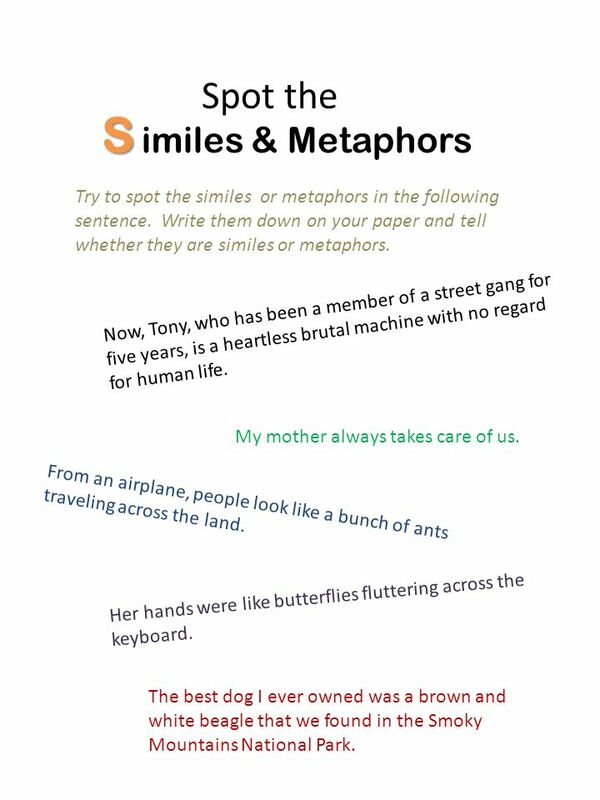 Write them down on your paper and tell whether they are similes or metaphors. Now, Tony, who has been a member of a street gang for five years, is a heartless brutal machine with no regard for human life. My mother always takes care of us. From an airplane, people look like a bunch of ants traveling across the land. Her hands were like butterflies fluttering across the keyboard. The best dog I ever owned was a brown and white beagle that we found in the Smoky Mountains National Park. Try to spot the similes or metaphors in the following sentence. 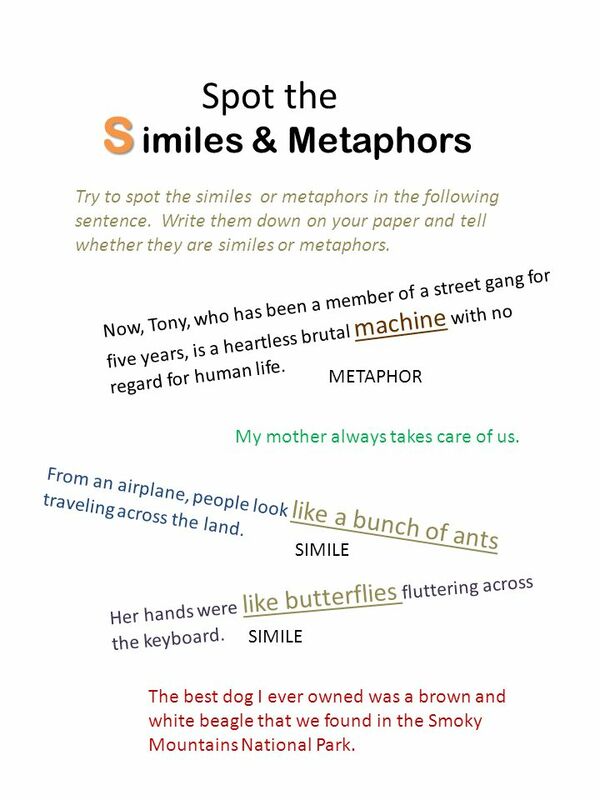 Write them down on your paper and tell whether they are similes or metaphors. Now, Tony, who has been a member of a street gang for five years, is a heartless brutal machine with no regard for human life. METAPHOR My mother always takes care of us. From an airplane, people look like a bunch of ants traveling across the land. SIMILE Her hands were like butterflies fluttering across the keyboard. SIMILE The best dog I ever owned was a brown and white beagle that we found in the Smoky Mountains National Park. 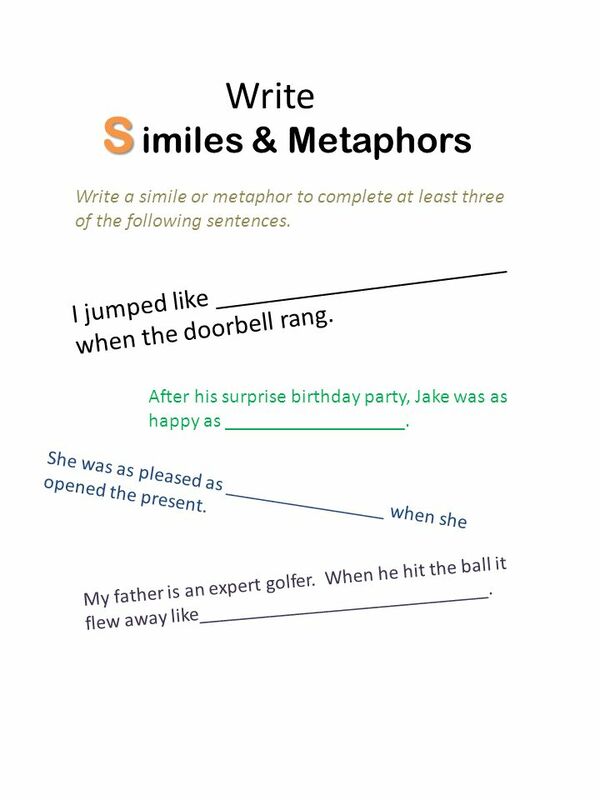 Write a simile or metaphor to complete at least three of the following sentences. I jumped like ______________________ when the doorbell rang. After his surprise birthday party, Jake was as happy as __________________. She was as pleased as ________________ when she opened the present. My father is an expert golfer. When he hit the ball it flew away like_____________________________. 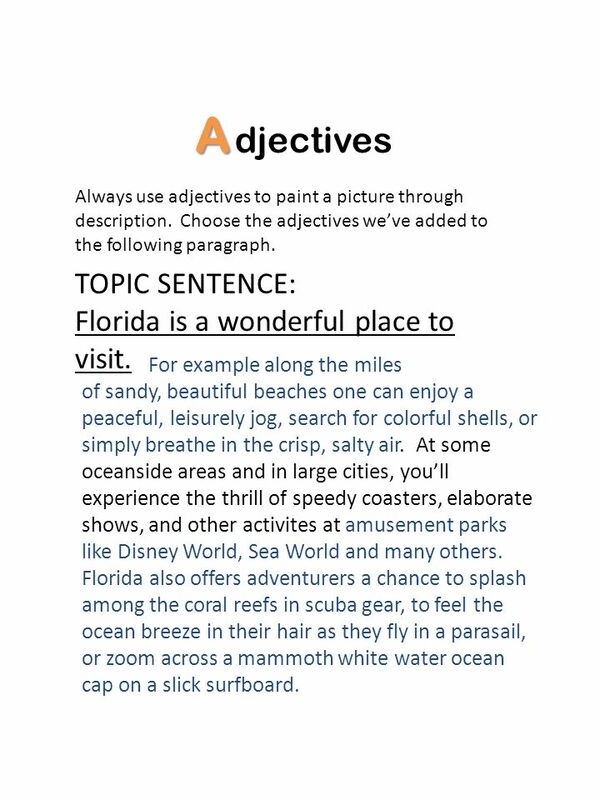 8 A djectives TOPIC SENTENCE: Florida is a wonderful place to visit. Always use adjectives to paint a picture through description. Choose the adjectives we’ve added to the following paragraph. TOPIC SENTENCE: Florida is a wonderful place to visit. For example along the miles of sandy, beautiful beaches one can enjoy a peaceful, leisurely jog, search for colorful shells, or simply breathe in the crisp, salty air. At some oceanside areas and in large cities, you’ll experience the thrill of speedy coasters, elaborate shows, and other activites at amusement parks like Disney World, Sea World and many others. Florida also offers adventurers a chance to splash among the coral reefs in scuba gear, to feel the ocean breeze in their hair as they fly in a parasail, or zoom across a mammoth white water ocean cap on a slick surfboard. 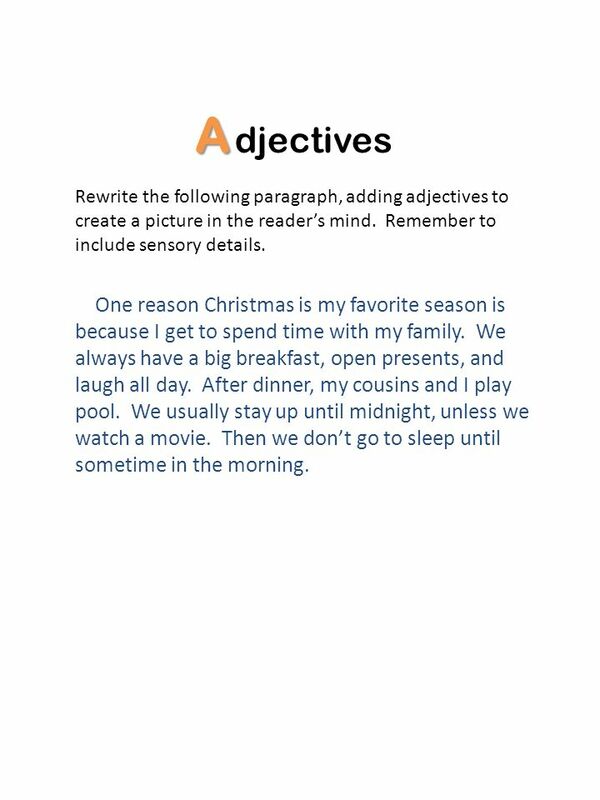 9 A djectives Rewrite the following paragraph, adding adjectives to create a picture in the reader’s mind. Remember to include sensory details. One reason Christmas is my favorite season is because I get to spend time with my family. We always have a big breakfast, open presents, and laugh all day. After dinner, my cousins and I play pool. We usually stay up until midnight, unless we watch a movie. Then we don’t go to sleep until sometime in the morning. 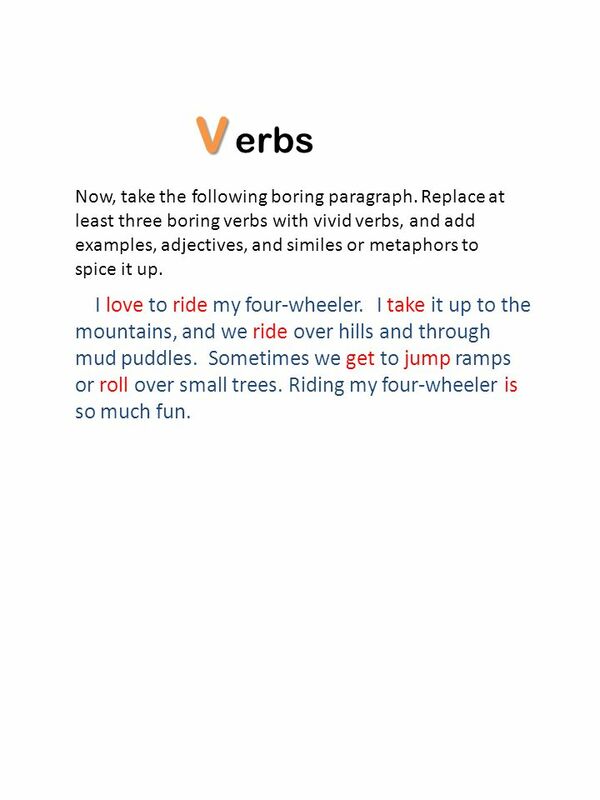 10 V erbs Throw out the boring verbs and add vivid verbs to spice up your paragraphs. Note the verbs in the following paragraph. On Christmas morning we get up and open presents. We eat breakfast after we open our presents. Then we play with our stuff and just stay at home on Christmas. 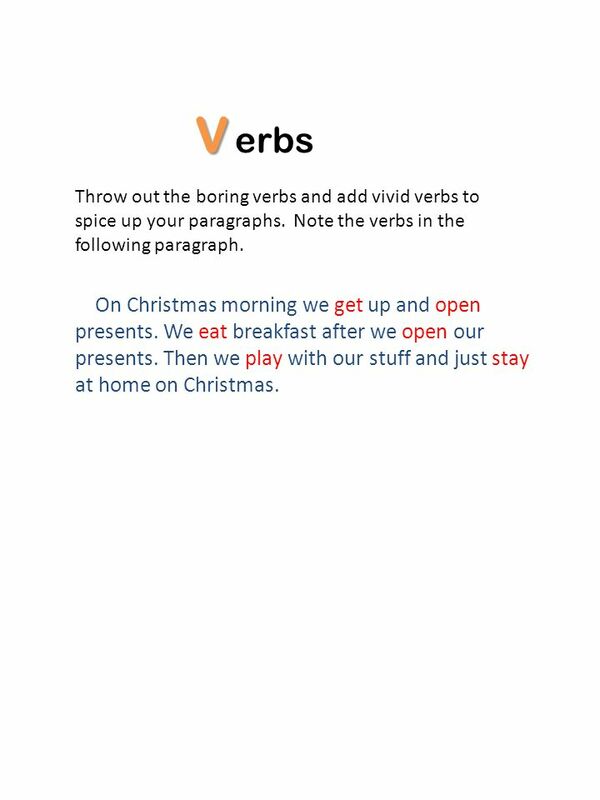 11 V erbs Throw out the boring verbs and add vivid verbs to spice up your paragraphs. Note the verbs in the following paragraph. On Christmas morning we get up and open presents. We eat breakfast after we open our presents. Then we play with our stuff and just stay at home on Christmas. 12 V erbs By changing the verbs you can spice up the paragraph. Adding adjectives, specific examples, and similes and metaphors help too. On Christmas morning we jump get up out of bed and quickly rip open the presents, hoping to find everything we anticipated. Next, we eat breakfast gather at the table for a delicious breakfast of pancakes, bacon, and egg casserole. after we open our presents. Then we play with our stuff zoom around on our scooters, shoot baskets on the Wii, or compete in a card game with our cousins. Home is like a vacation paradise at Christmas. with our stuff and just stay at home on Christmas. 13 V erbs Now, take the following boring paragraph. 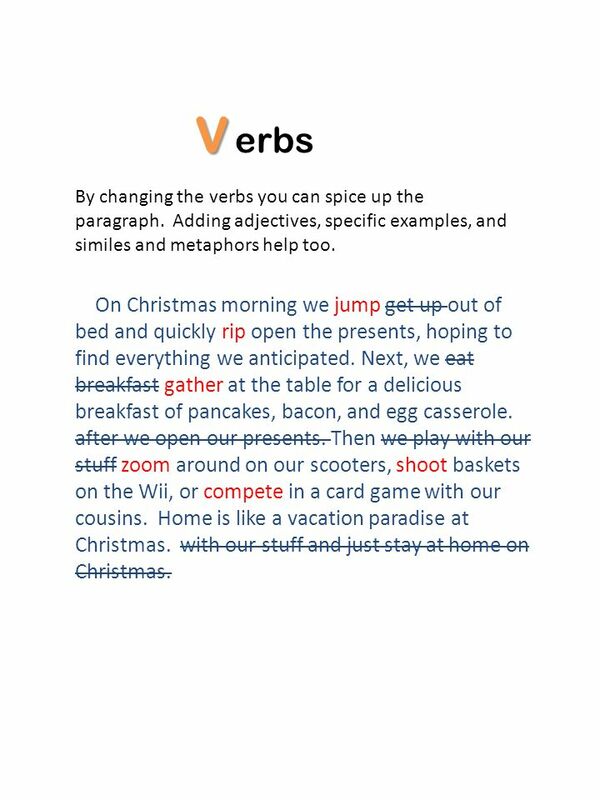 Replace at least three boring verbs with vivid verbs, and add examples, adjectives, and similes or metaphors to spice it up. I love to ride my four-wheeler. I take it up to the mountains, and we ride over hills and through mud puddles. Sometimes we get to jump ramps or roll over small trees. Riding my four-wheeler is so much fun. 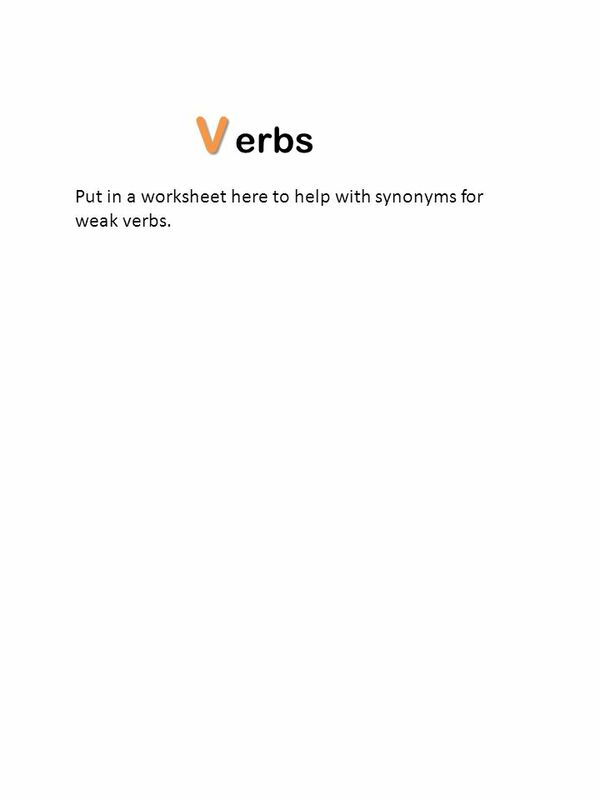 14 V erbs Put in a worksheet here to help with synonyms for weak verbs. 15 A necdotes An anecdote is a short account of an interesting or amusing incident. It is often a personal experience. 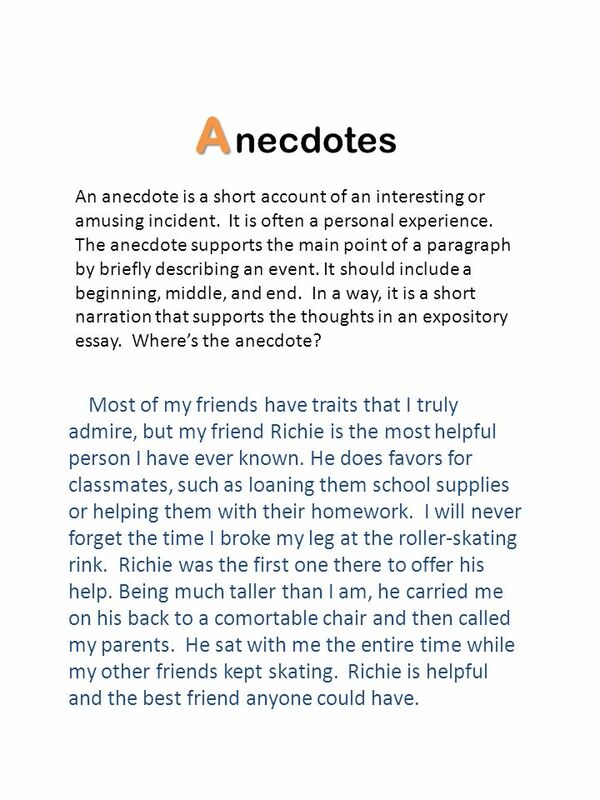 The anecdote supports the main point of a paragraph by briefly describing an event. It should include a beginning, middle, and end. In a way, it is a short narration that supports the thoughts in an expository essay. Where’s the anecdote? 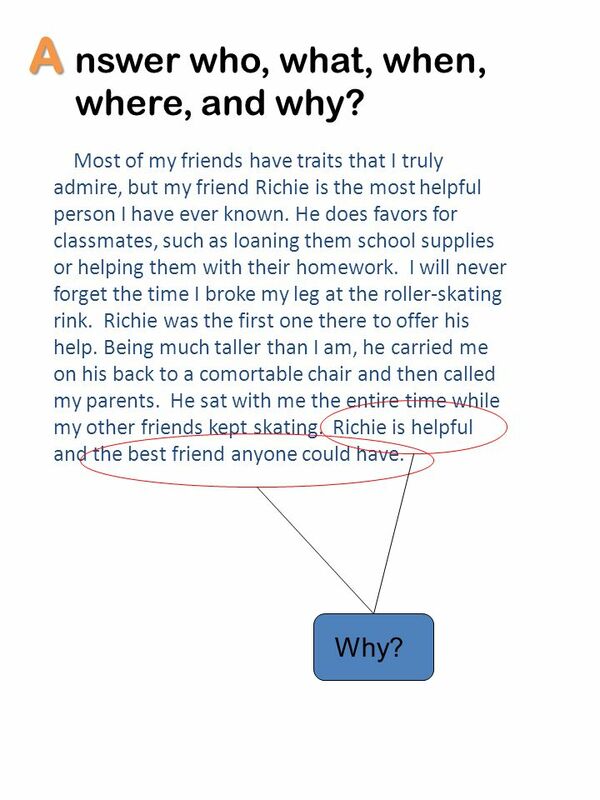 Most of my friends have traits that I truly admire, but my friend Richie is the most helpful person I have ever known. He does favors for classmates, such as loaning them school supplies or helping them with their homework. I will never forget the time I broke my leg at the roller-skating rink. Richie was the first one there to offer his help. Being much taller than I am, he carried me on his back to a comortable chair and then called my parents. He sat with me the entire time while my other friends kept skating. Richie is helpful and the best friend anyone could have. 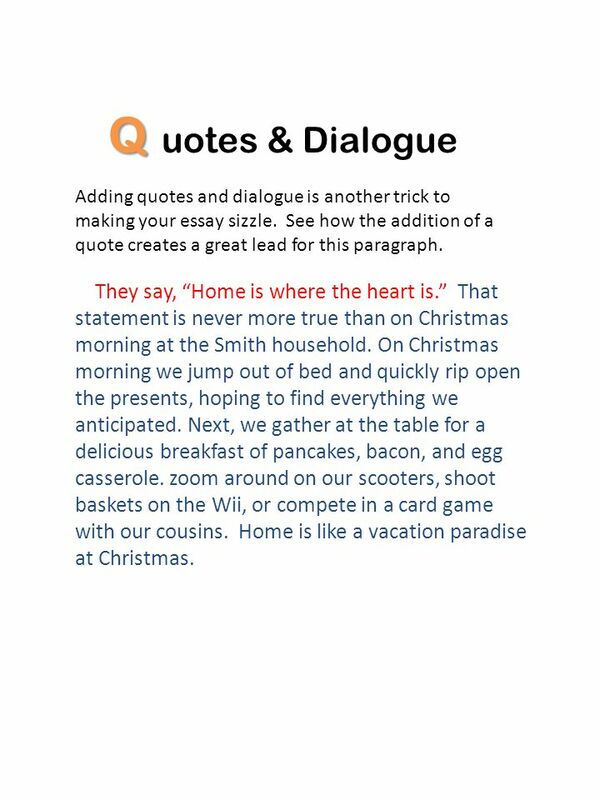 16 Q uotes & Dialogue Adding quotes and dialogue is another trick to making your essay sizzle. See how the addition of a quote creates a great lead for this paragraph. They say, “Home is where the heart is.” That statement is never more true than on Christmas morning at the Smith household. On Christmas morning we jump out of bed and quickly rip open the presents, hoping to find everything we anticipated. Next, we gather at the table for a delicious breakfast of pancakes, bacon, and egg casserole. zoom around on our scooters, shoot baskets on the Wii, or compete in a card game with our cousins. Home is like a vacation paradise at Christmas. 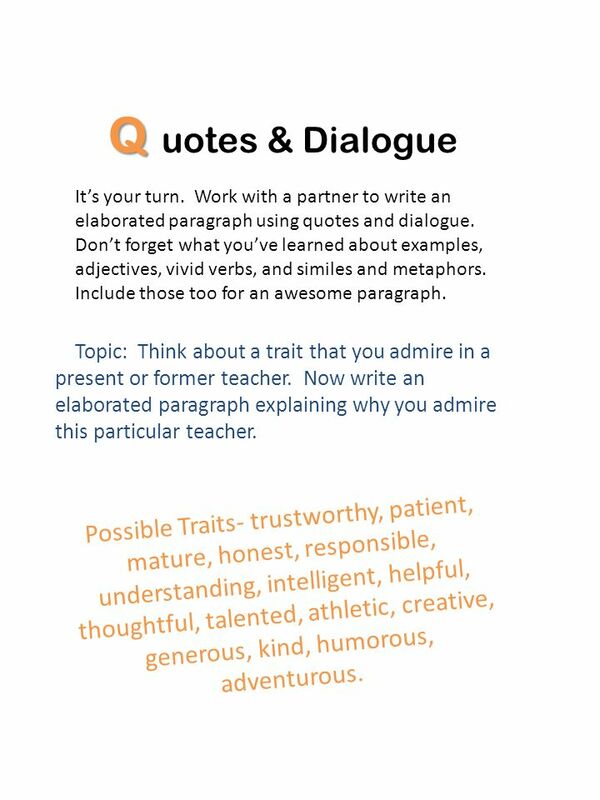 17 Q uotes & Dialogue You can also add a quote or dialogue to help tell a story or explain your point. I admire my mom because she is so generous with my friends. Whenever I have a sleepover, she waits on us hand-and-foot. I can almost hear her now, “What can I get your girls to drink?” Or she might ask, “What would you like for dinner tonight? Do you want to order pizza or go out for hamburgers?” She’s always making everyone feel comfortable and, of course, well fed. She really knows how to relate to teenagers. 18 Q uotes & Dialogue It’s your turn. Work with a partner to write an elaborated paragraph using quotes and dialogue. Don’t forget what you’ve learned about examples, adjectives, vivid verbs, and similes and metaphors. Include those too for an awesome paragraph. Topic: Think about a trait that you admire in a present or former teacher. Now write an elaborated paragraph explaining why you admire this particular teacher. Possible Traits- trustworthy, patient, mature, honest, responsible, understanding, intelligent, helpful, thoughtful, talented, athletic, creative, generous, kind, humorous, adventurous. 19 C ompare & Contrast When you write an essay about why you like one thing better than another, comparison/contrast is a good method to use for support. 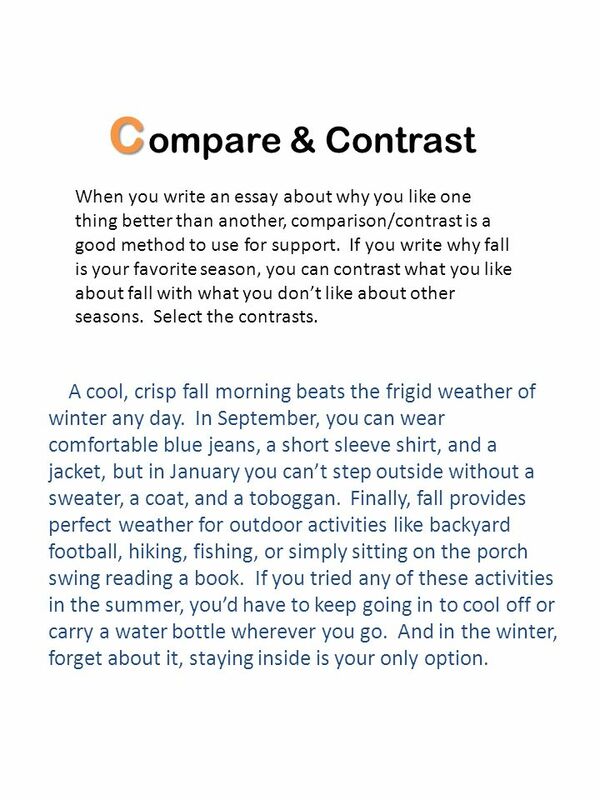 If you write why fall is your favorite season, you can contrast what you like about fall with what you don’t like about other seasons. Select the contrasts. A cool, crisp fall morning beats the frigid weather of winter any day. In September, you can wear comfortable blue jeans, a short sleeve shirt, and a jacket, but in January you can’t step outside without a sweater, a coat, and a toboggan. Finally, fall provides perfect weather for outdoor activities like backyard football, hiking, fishing, or simply sitting on the porch swing reading a book. If you tried any of these activities in the summer, you’d have to keep going in to cool off or carry a water bottle wherever you go. And in the winter, forget about it, staying inside is your only option. 20 C ompare & Contrast Now choose from one of the topics below and write a paragraph that includes comparisons or contrasts as supporting ideas. This is just one paragraph. Topic 1: Choose your favorite day of the week Explain why it is your favorite. Topic 2: Choose the animal that makes the best pet and explain why it makes the best pet. Remember this is just a paragraph, so choose one reason it makes a good pet and elaborate on that one reason. 21 A nswer who, what, when, where, and why? 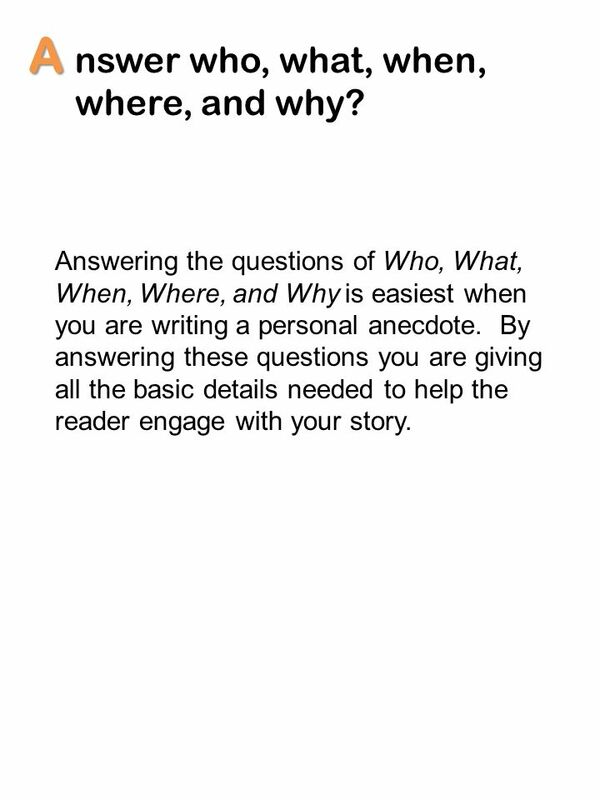 Answering the questions of Who, What, When, Where, and Why is easiest when you are writing a personal anecdote. By answering these questions you are giving all the basic details needed to help the reader engage with your story. 22 A nswer who, what, when, where, and why? 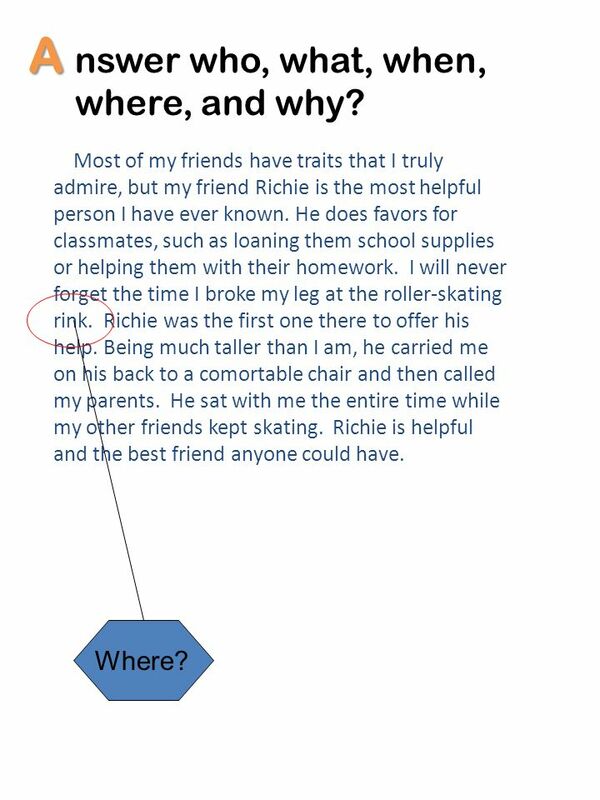 Most of my friends have traits that I truly admire, but my friend Richie is the most helpful person I have ever known. He does favors for classmates, such as loaning them school supplies or helping them with their homework. I will never forget the time I broke my leg at the roller-skating rink. Richie was the first one there to offer his help. Being much taller than I am, he carried me on his back to a comortable chair and then called my parents. He sat with me the entire time while my other friends kept skating. Richie is helpful and the best friend anyone could have. 23 A nswer who, what, when, where, and why? Who? 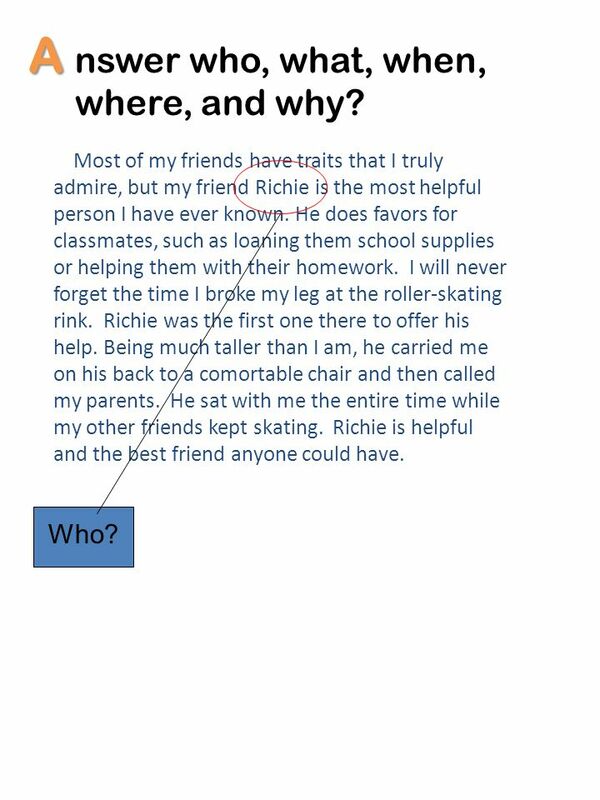 Most of my friends have traits that I truly admire, but my friend Richie is the most helpful person I have ever known. He does favors for classmates, such as loaning them school supplies or helping them with their homework. I will never forget the time I broke my leg at the roller-skating rink. Richie was the first one there to offer his help. Being much taller than I am, he carried me on his back to a comortable chair and then called my parents. He sat with me the entire time while my other friends kept skating. Richie is helpful and the best friend anyone could have. Who? 24 A nswer who, what, when, where, and why? What? 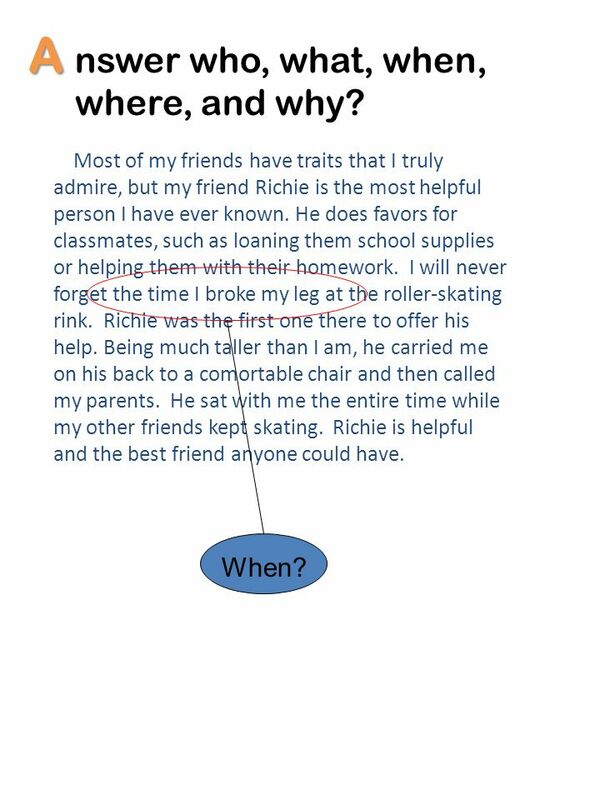 Most of my friends have traits that I truly admire, but my friend Richie is the most helpful person I have ever known. He does favors for classmates, such as loaning them school supplies or helping them with their homework. I will never forget the time I broke my leg at the roller-skating rink. Richie was the first one there to offer his help. Being much taller than I am, he carried me on his back to a comortable chair and then called my parents. He sat with me the entire time while my other friends kept skating. Richie is helpful and the best friend anyone could have. What? 25 A nswer who, what, when, where, and why? When? 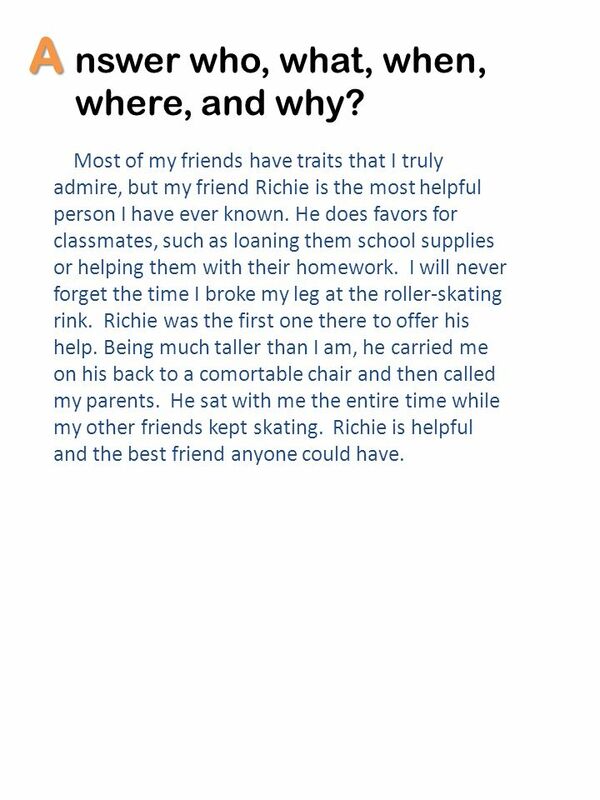 Most of my friends have traits that I truly admire, but my friend Richie is the most helpful person I have ever known. He does favors for classmates, such as loaning them school supplies or helping them with their homework. I will never forget the time I broke my leg at the roller-skating rink. Richie was the first one there to offer his help. Being much taller than I am, he carried me on his back to a comortable chair and then called my parents. He sat with me the entire time while my other friends kept skating. Richie is helpful and the best friend anyone could have. When? 26 A nswer who, what, when, where, and why? Where? 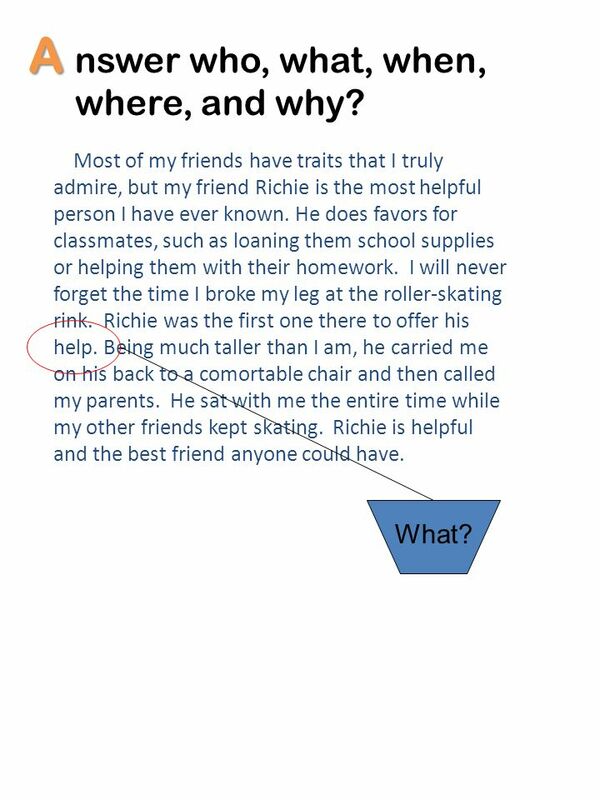 Most of my friends have traits that I truly admire, but my friend Richie is the most helpful person I have ever known. He does favors for classmates, such as loaning them school supplies or helping them with their homework. I will never forget the time I broke my leg at the roller-skating rink. Richie was the first one there to offer his help. Being much taller than I am, he carried me on his back to a comortable chair and then called my parents. He sat with me the entire time while my other friends kept skating. Richie is helpful and the best friend anyone could have. Where? 27 A nswer who, what, when, where, and why? Why? Most of my friends have traits that I truly admire, but my friend Richie is the most helpful person I have ever known. He does favors for classmates, such as loaning them school supplies or helping them with their homework. I will never forget the time I broke my leg at the roller-skating rink. Richie was the first one there to offer his help. Being much taller than I am, he carried me on his back to a comortable chair and then called my parents. He sat with me the entire time while my other friends kept skating. Richie is helpful and the best friend anyone could have. Why? 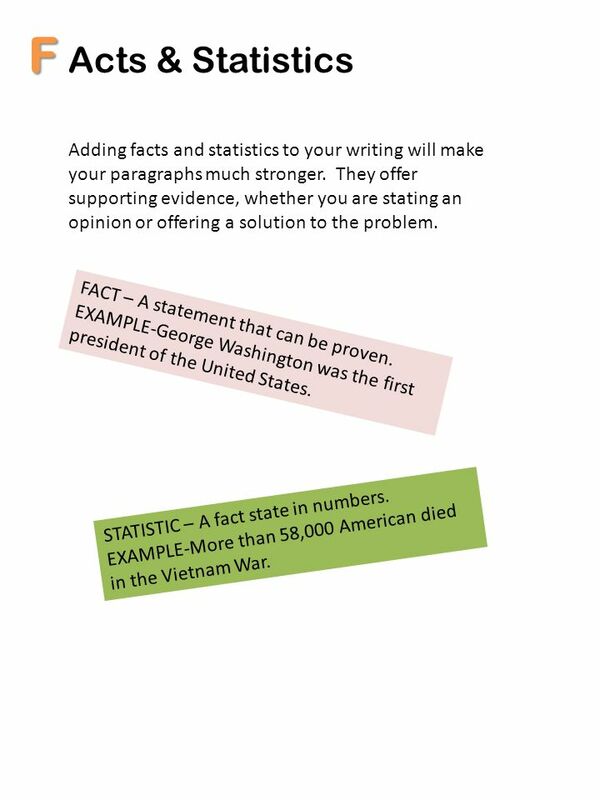 28 F Acts & Statistics Adding facts and statistics to your writing will make your paragraphs much stronger. They offer supporting evidence, whether you are stating an opinion or offering a solution to the problem. FACT – A statement that can be proven. EXAMPLE-George Washington was the first president of the United States. STATISTIC – A fact state in numbers. EXAMPLE-More than 58,000 American died in the Vietnam War. 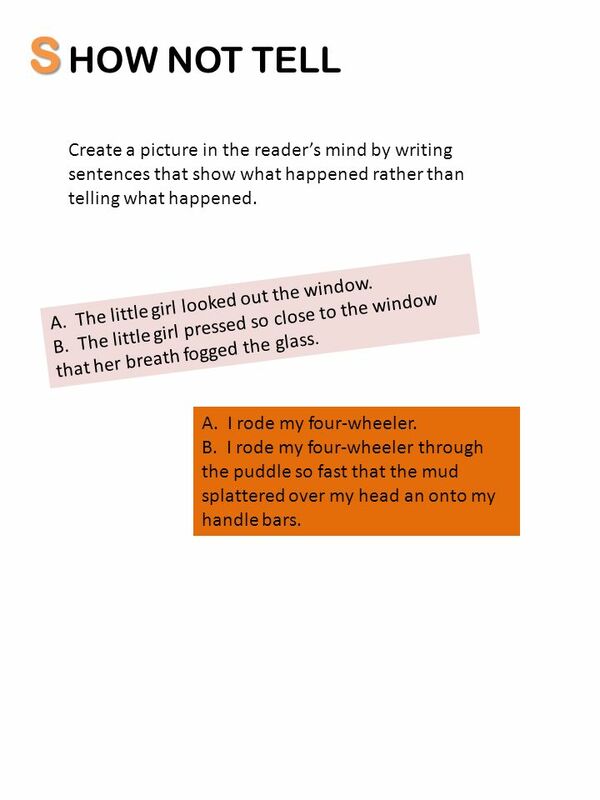 29 S HOW NOT TELL Create a picture in the reader’s mind by writing sentences that show what happened rather than telling what happened. A. The little girl looked out the window. B. The little girl pressed so close to the window that her breath fogged the glass. A. I rode my four-wheeler. B. I rode my four-wheeler through the puddle so fast that the mud splattered over my head an onto my handle bars. 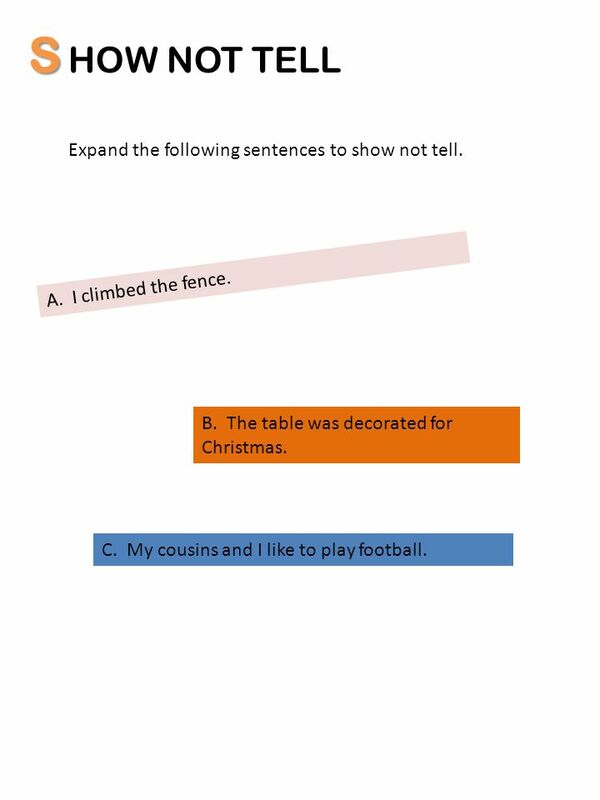 30 S HOW NOT TELL Expand the following sentences to show not tell. A. I climbed the fence. B. The table was decorated for Christmas. C. My cousins and I like to play football. 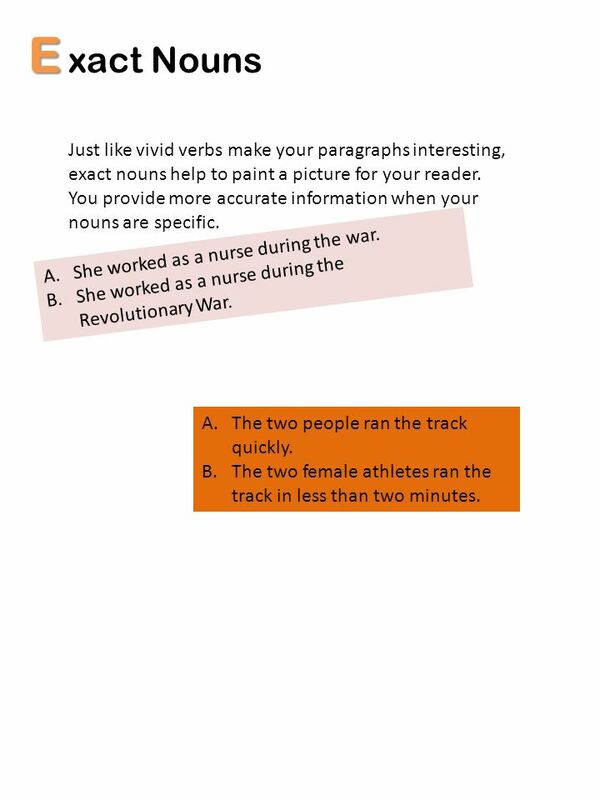 31 E xact Nouns Just like vivid verbs make your paragraphs interesting, exact nouns help to paint a picture for your reader. You provide more accurate information when your nouns are specific. She worked as a nurse during the war. She worked as a nurse during the Revolutionary War. The two people ran the track quickly. The two female athletes ran the track in less than two minutes. 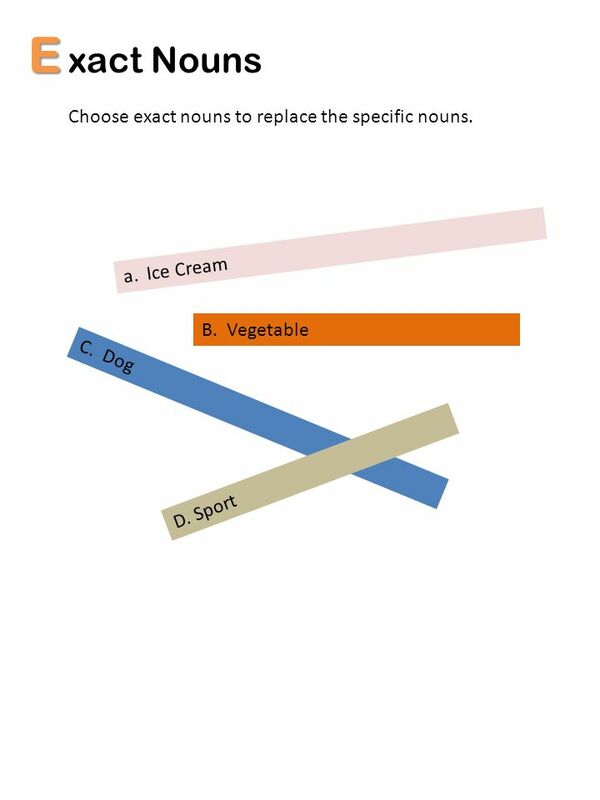 32 E xact Nouns Choose exact nouns to replace the specific nouns. Download ppt "E L A B O R T I N xamples Simi es & metaphors djectives Ver s Qu"
Instructions for using this template. Remember this is Jeopardy, so where I have written Answer this is the prompt the students will see, and where I. HOW TO DO GREAT TAKING TESTS! Sasha Carp Counselor Fruitville Elementary. An effective method to guide students through the writing process. The Hamburger Writing Model Mr. Gurian Osceola Middle School. 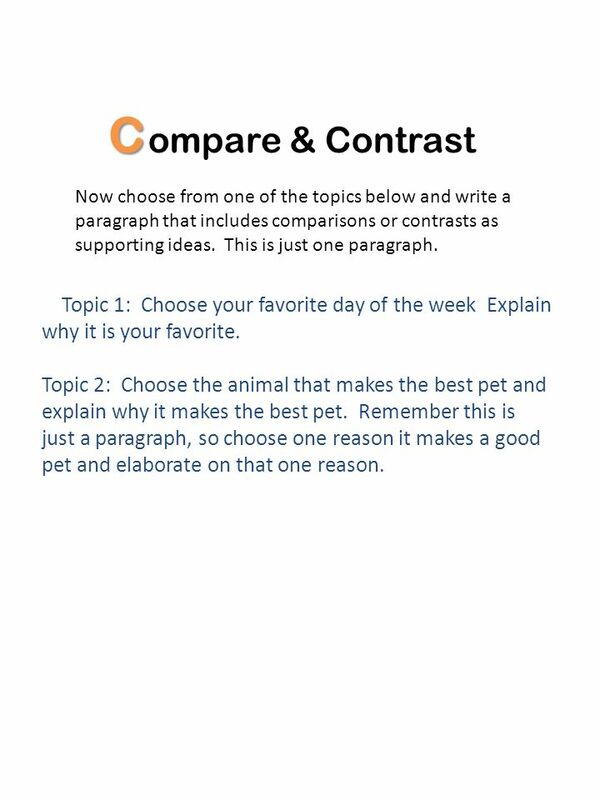 3 rd Grade – CRCT Practice English/Language Arts Paragraph Content and Organization. How to write a really great paragraph! BODY PARAGRAPHS SUPPORT: FROM BARE TO ELABORATED. The Six Traits of Writing. Student Objectives Students will: Use clarity: the message must be easily identified. Stay focused: the topic is narrowed down. Types of Writing Narrative Descriptive Expository Persuasive. Elaboration. 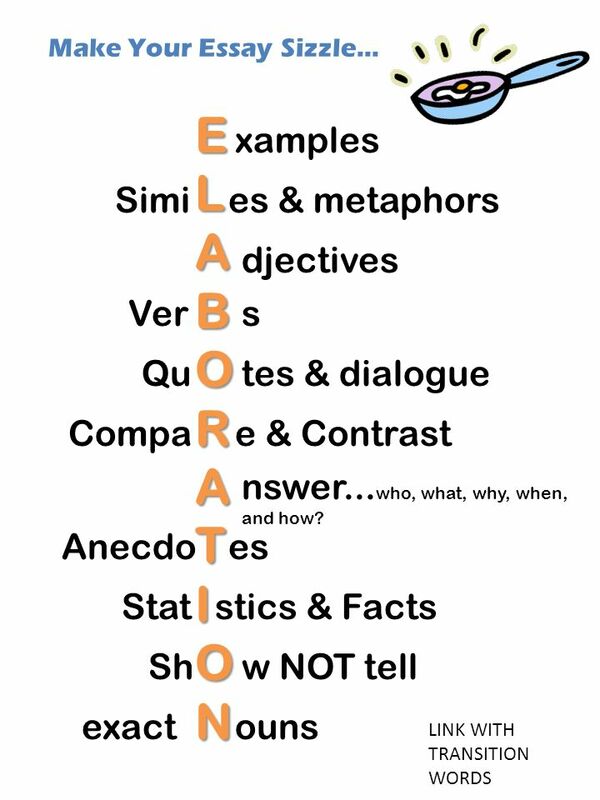 What is elaboration? Telling the reader more by using specific words, extensions (phrases and clauses), onion-like layering, or specific.